Sometimes I’m a slow speaker- it takes me a while to form my sentences, I really should only open my mouth when I’ve concluded the idea in my head- but frustratingly I’m usually in a rush. My husband has a habit of finishing of my sentences during these lapses- its very frustrating- at times I give up or get angry. Many of the older people we work with daily face having words put in their mouth and getting left out of the conversation completely either with hearing loss or dementia’s. My dad in his later years was very hard of hearing. For years he blamed me for mumbling, or here’s the irony- speaking to fast. I did encourage him to get his hearing tested. The Sainsbury’s food delivery would ring me sometimes, explaining they had been ringing his door bell for ages, but there was no reply- he blamed it on a faulty door bell. He was a very intelligent man, perhaps the denial was his pride getting in the way, or fear of aging, that hearing loss would get worse and next could be his eyes or memory…? When he evenly got his hearing aid, its great promise of opening up the world, a reduction in his isolation, was quickly replaced with frustration. Sadly it just didn’t suit dad. Our main way of communicating- the phone, was as bad as ever- conversations were at time frustrating for both of us. Hearing loss is a great loss for all people in the family or community. Last week at Stoneleigh House Care Home, we sat with a group of 6 ladies each one of them with hearing loss. They smiled politely as we did our best to run a reminiscence group for the project The Homeless Library, where they couldn’t hear their neighbour. Slowly and carefully we shared back to them their reminiscences with, one person’s memories stimulating another’s. Subjects ranged from The Means Test to Traveling Salesmen, Social Security, The Workhouse and Gypsies. In this blog I’m going to focus on people knocking on the door, in honour of my dad- he would have missed all the fun. 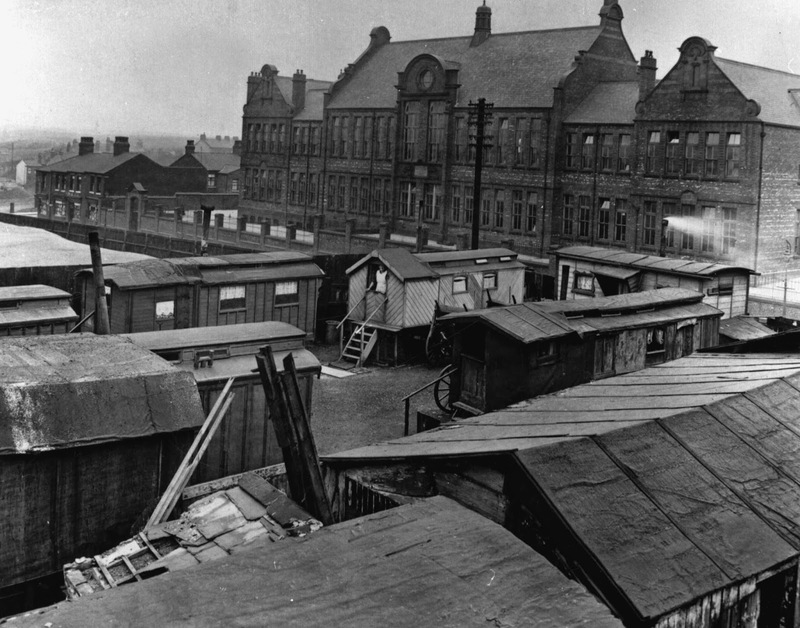 May was born during WW2 in Oldham, she worked in a Cotton Mill as did her mother and father. Men knocking on the door. Sort of sling round their neck saying who they were and what they were about. Asking for money, begging. Soldiers with half a leg, come back from the war. My mother always said: "What you give, you get back." True. Remember gypsies selling combs. Sikhs selling this and that. Little things stick in your mind. A turban with a jewel. Gypsies, they'd curse you. Mutter at you.. If you didn't buy they'd chunner at you and mutter. Never quite sure what they were saying. 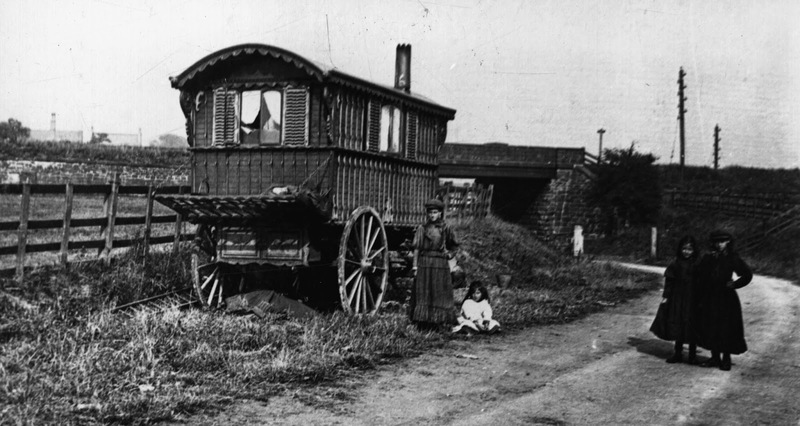 Gypsies coming around, my mother was petrified, she would always buy something so they didn’t put a curse on her. Fearful my mum was, she'd always a buy a piece of lucky heather or pegs they made. They wore a black head scarves, a shawl, quite a few were Irish. Sometimes they would have a child with them, a lady and a child. We never saw a man. "Buy a piece of lucky heather missus, or I'll put a curse on the house." I could never work out if they were supposed to be cursing me or bringing luck! Heather or pegs. A child with them, it was a pity thing. There was a fair next to the first school I worked in in Bury, the old St Marie’s. we’d have gypsy/fairground children in the school, they didn’t get any education, always moving on. They weren’t disruptive. Would stay for two weeks then move onto the next area. It's a good life, a hard life. Can get stuck there. Worked for grub a lot of times on building sites. You get stuck on a site they might not pay you, but if you were a good worker you always got fed. If the kids needed to go to school, we'd move. The kids, we kept them at work. It's a hard life for kids, sleeping in the back of vans or whatever. Meet different people, have a drink with them. I'm too old now, give me 10 years I'll be in my box.